The Toucans are based in Seattle, but we play all around the Tropical Northwest. Find out how to have our band play at your next event! 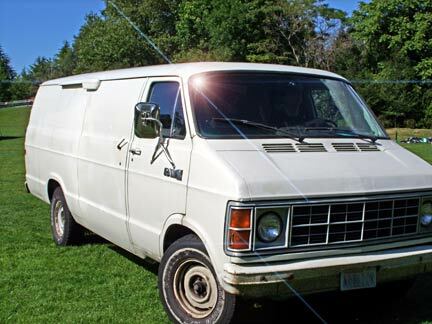 We travel in a spotless white van to locales as distant as Spokane, Pullman, Yakima, Boise, Bellingham, Olympia, and Portland. If your event is more than about 30 minutes from the Seattle area, or requires a ferry ride, some travel fees may apply in addition to the normal performance rates. The Toucans are in highest demand during the weekends and evenings of Spring & Summer. A two or three hour performance is usually about right for most events, but if your event has people coming and going (large conventions, corporate functions, etc.) we can perform for up to six hours! 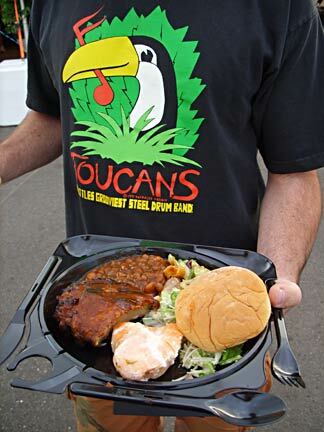 The Toucans will need some food provided during longer events. 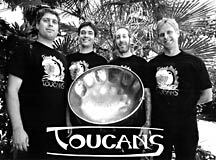 The Toucans Steel Drum Band is a 4-person group: 3 steel drums and a small drum set playing instrumental music from the Caribbean & beyond! Our instruments are all acoustic, and require no electricity, staging or amplification. The band does require a flat, level playing area of at least 10' x 15' on a solid surface (no bark, sand, mud or gravel). Grass is OK, as long as the surface is even and not lumpy, soggy or sloped. The Toucans only need about 15-20 minutes to set up; there's no need for alarm if we show up just a half-hour before the scheduled start time! 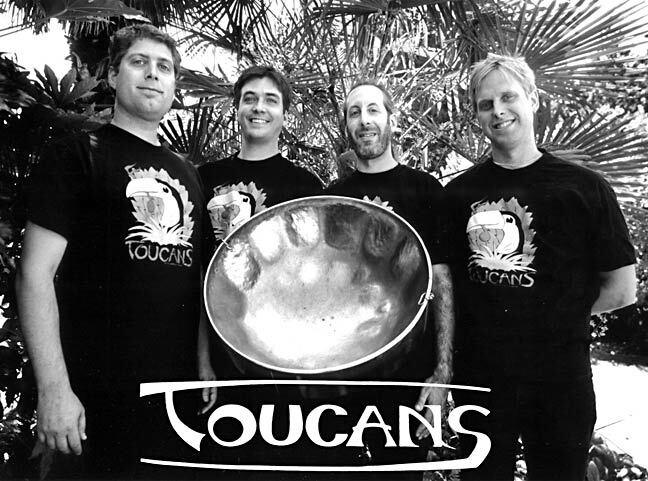 The Steel Drums are sensitive to direct sunlight, and can go out of tune quickly if the metal playing surface gets hot, so the Toucans require a shady area (or at least a 10' x 10' canopy) during the hot days of summer. Other shade solutions that work for us are setting up under some big trees, or next to a building overhang or awning. As you can see from the photo, the Toucans are a small group, with 3 sets of steel drums and a small drum kit. That's all it takes to make the big Toucans Sound! 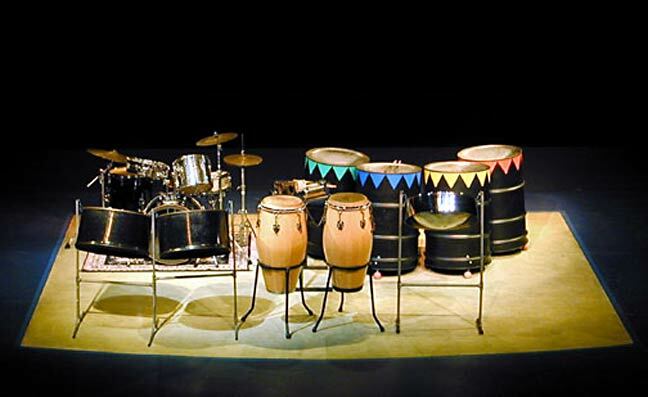 The Toucans also travel with a fun assortment of percussion instruments. When the party gets going, the Toucans can kick up the jams with some great dancing rhythms! The Toucans require a 12' x 16' area for stage performance. We can load on or off in well under 15 minutes (given a staging area), and sound reinforcement is a snap! For audiences of under 150 persons, no sound reinforcement is required other than one (preferably switchable) announce mic. For larger audiences, just set up a high stereo pair to either side of the band even with the front line. The group is all-acoustic, and the band sounds well-mixed at a distance of 6-10 feet. If you have one or two extra mics, a single one behind the bass drums and another on the kick drum can make a big difference. A switchable announce mic is also appreciated. 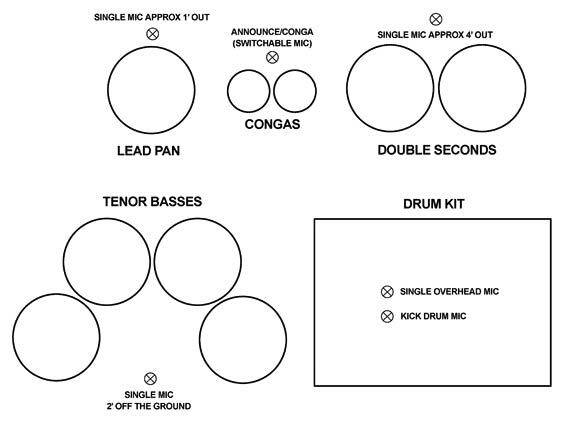 For venues larger than 500 people, consult our handy Stage Plot Diagram for the complete mic list. 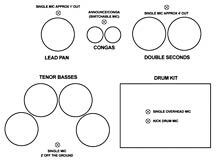 Breakdown: (1) announce/conga mic; (2) front-line mics (two steel pan players); (1) bass pan mics (2 additional PZM mics are optional); (2) drum set mics (kick & overhead). Toucans: Perfect For Any Event!